Welcome back to another hop around the globe with my fellow Demonstrators sharing our Gift Packaging projects. 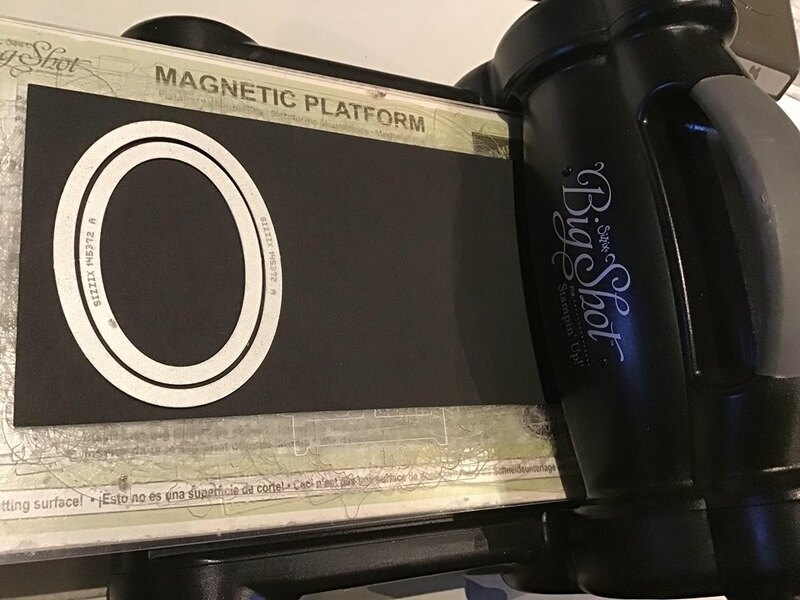 You may be starting the hop with me or just arrived from someone else in the loop, but you won’t want to miss anyone so I’ve listed everyone at the bottom of this post. A warm welcome to you joining me, Sandra, here in the UK for todays hop. 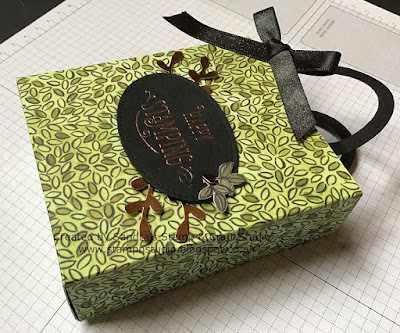 As crafters, we love making our own gift packaging and you have probably seen a few already on my Blog already. For todays hop, I’ve got away from the festive season and back to my all time favourite, Share What You Love Speciality Designer Series Paper #146926. I have made these cute bags in all shapes and sizes over the years, even as large as using two sheets of 12″ Designer Series Paper, and was reminded of them by a fellow demonstrator on our global group recently doing some teeny, tiny ones ….. literally ….. anything goes ! I like to try and maximise the piece of card or paper I start with, whether A4 or 12″x12″, so not ending up trimming off a small wasteful piece, so today I started with a 12″x12″ DSP cut in half at 6″. You will need to be careful with any design that is one-directional. These Designer Series Papers have a lovely pearlescent finish on some of the elements. 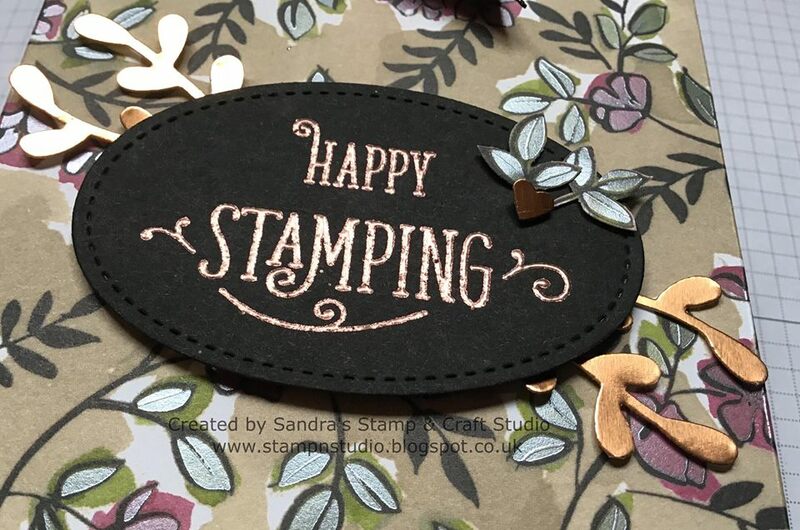 I chose to compliment this using the Copper Stampin’ Emboss Powder #141636 for the sentiment from a Demonstrator exclusive stamp set Stamping Your Way To The Top #149733, adding a couple of leaves using Sprig punch #148012, cut from Copper Foil Sheets #142020. For those who spotted the finer embellishments, I fussy cut some leaf elements from DSP and punched a teeny heart in scrap of Copper Foil sheet using the Cookie Cutter Builder punch #140396 to hide the join in the stems. Using the Stitched Shapes Framelits #145372, I cut two oval ‘handles’ using the two largest sizes, positioned equally inside each other. The ribbon on the handle is our 3/8″ Basic Black Shimmer Ribbon #144129. Making two projects from one sheet is always good news and here I have done an ‘inny & outy’, to showcase both sides of this gorgeous paper. Like many crafters, every year I am rushing around trying to finish last minute Christmas cards & gifts, making deliveries but enjoying a glass of warming Mulled Wine at the end of each day. These bags could be prepared in festive colours ahead of the busy season, decorated and ‘flat-packed’ in a poly pocket, ready to assemble when needed. 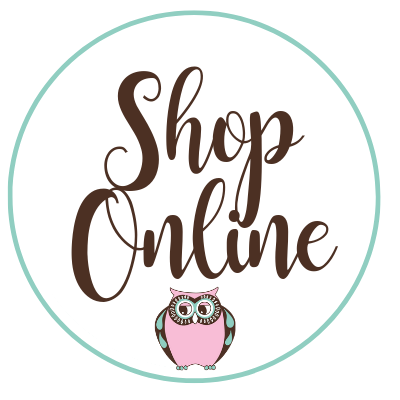 I hope you have enjoyed my Gift Packaging theme project today and that enjoy the rest of your day. Here are all the participants this month. Simply click on the ‘Next’ button to hop to Shirley and continue along your hop around the globe. Wow, what adorable bags! And your handles are so creative! I love your bags! I have made these over the years as well, but always use ribbon for the handles. 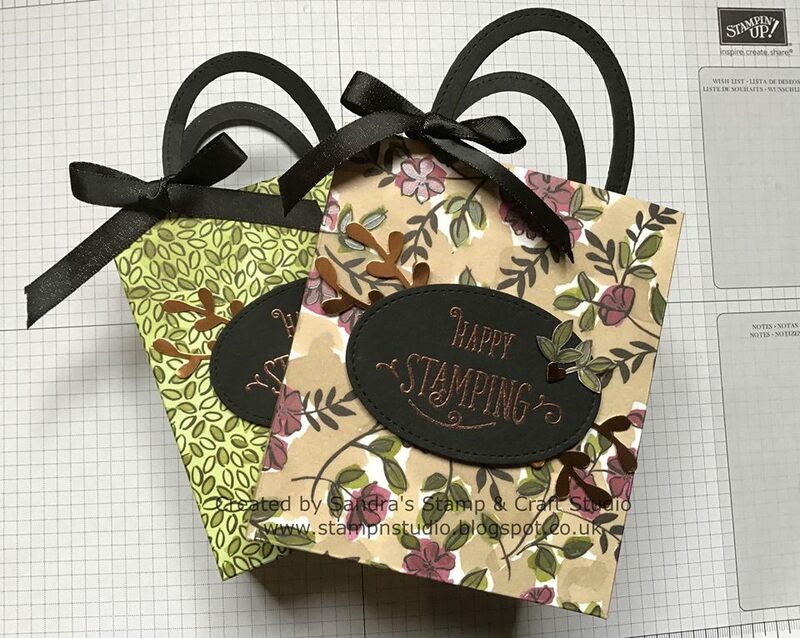 I love your tip about using our nesting oval dies to create paper handles instead! 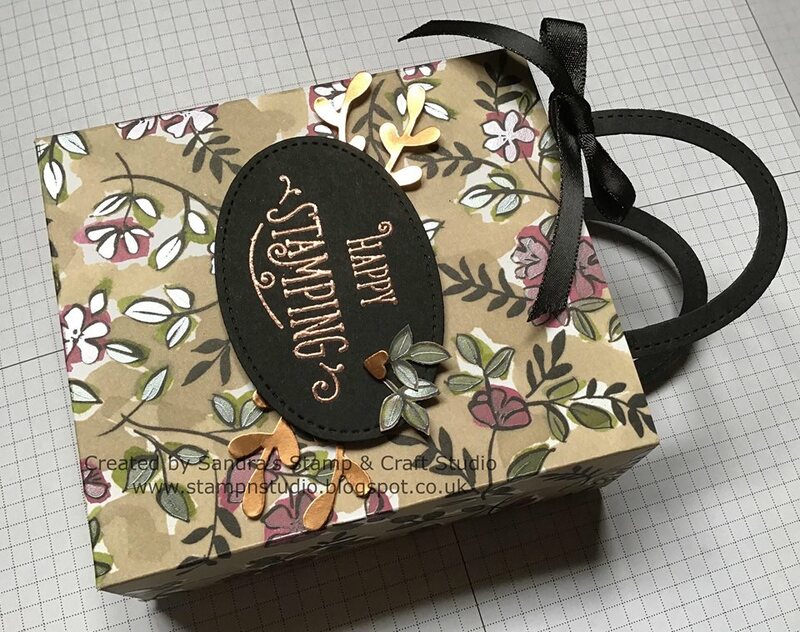 The handles are a great idea and I love the fussy cutting from DSP scraps. Great tips, thanks. Such a sweet little bag! Your bags are so cute! In like the paper handles, I a l so use ribbon, but will try this next time.